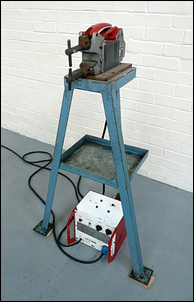 Last issue in Spot welders for the home workshop, Part 1 we looked at spot welders – how they work, and how they might be suitable for a home workshop. In that story we showed how cheap commercial spot welders, and home-built items, were likely to be unsuitable for welding anything but the thinnest of steel sheets. We also showed that a commercial, good quality portable spot welder suitable for welding up to 1mm + 1mm sheet would cost you around AUD$1,100. But what about a second-hand spot welder? 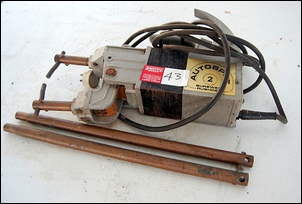 If you watch auction and ‘for sale’ sites, it’s not hard to find second-hand spot welders. These are typically mounted on a pedestal (rather than being hand-held) but in most other important respects, are much the same as a brand new item you might buy today. Except for two aspects – they’re cheaper, and they’re often more powerful. It was the last aspect that really interested me – as we described last issue, it is the lower available secondary current flows of most spot welders that tends to stymie the welding of thicker sheet material. 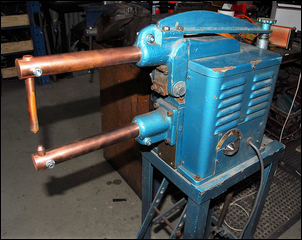 Unless you have access to three-phase 415V power, the thing to most look out for when selecting a second-hand spot welder is that it must (here in Australia) run off single-phase 240V. 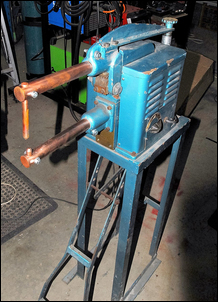 Single phase spot welders appear for sale less often than three-phase machines. However, they do appear – it’s just a case of watching-out for them over a period. In short, the higher the power rating on the maker’s plate, the better. Also ensure that the welding tips are not badly worn (ie overly short), that the upper and lower tips align when the arms are closed, and have the welder demonstrated as working before putting down the cash. But how do the power ratings make sense? But how can 240V welders ever have a really high secondary current? For example, if the maximum current draw at 240V is 15 amps, that gives an input power of (240 x 15 =) 3,600 watts. With a secondary output voltage of (say) 2V, that gives a max secondary current of (3600 / 2 =) 1800 amps. That’s still a lot, but it’s a lot less than the 3,800 amps claimed by say the Telwin 20 TI welder described last issue. So what is going on? Let’s take a look at the Telwin’s specs in more detail. The rated input voltage of the Telwin is 230V and the output is 2V, that is, a 115 times voltage ratio. The output maximum current is said to be 3,800 amps, indicating that the input current must be at least 33 amps (ie 3800 / 115). All through a 16-amp plug! So with 33 amps being drawn, why doesn’t all the workshop wiring immediately vaporise? It probably would (or at least get very hot – until a circuit breaker or fuse blew) if the current draw were continuous. The spot weld process itself lasts for a maximum of seconds. Furthermore, the maximum quoted frequency of welds is just three per minute. Even if there is a voltage drop through the mains wiring is as great as 30 or 40 volts, that’s around 1kW of power being dissipated in the wiring for a short time, three times a minute. In practice, the wires don’t even grow warm to touch. That said, as is the case with all the hundreds of conventional welders where the owner has filed the earth pin on the 15-amp plug to make it fit a 10-amp receptacle, it pays not to be casual about any of this. Don’t do a large number of welds per minute, and always check that points of higher resistance in the wiring (eg power points, junction boxes and circuit breaker panels) don’t grow warm. Never oversize the circuit breaker or fuse. 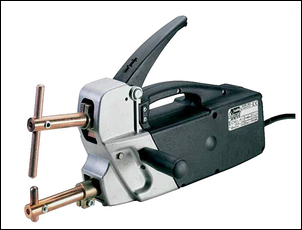 When running a spot welder, in Australia a specific circuit and 15-amp power point should be used. It took about six months for me to find a second-hand welder that was sufficiently geographically close, sufficiently powerful and priced right. 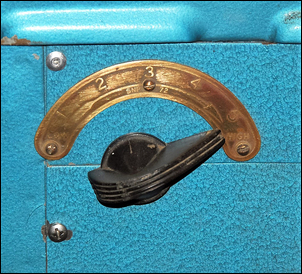 The one I found was a pedestal welder claimed to be able to weld together two 2mm thick washers on only setting ‘3’ (of ‘5’) on the power dial, was single phase and was very heavy. Unfortunately, there was no longer attached any maker’s plate with specs, and the machine was sufficiently old that I could find no reference to it anywhere else. It was priced at AUD$875 but I knocked the seller down to AUD$700, contingent on his demonstrating the welder in action. This he did, so I bought it – all 76kg of it. The first step was to perform some basic maintenance on the machine. 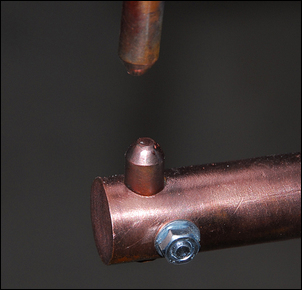 When purchased, the copper electrode faces (that is, the bits that contact the workpiece) were pitted and rough, and were also of different diameters top and bottom. I removed the electrodes and used a lathe, file and sander to smooth the ends of the electrodes into cones that tapered to 5mm diameter flat faces. The upper arm, the one that lifts and then clamps down, pivots on a large bolt. However, the machined hole in the brass housing (through which this bolt passes) had grown larger over time. This allowed the upper arm to move sideways a little, so the upper electrode no longer clamped precisely on the lower electrode. The use of a slightly larger diameter bolt and spring washers positioned either side removed this slack. With the two electrodes then clamping together properly, a fine tooth file was clamped lightly between the electrode faces and stroked back and forth to give dead flat contact surfaces. I also removed the cover over the transformer and gave everything a visual check. This showed that the welder was made with very heavy duty parts – the ‘power’ selection switch and the on/off welding switch both being very substantial chunks of copper. Without having any data on the machine, I was curious to measure its parameters. There’s no easy way of measuring the all-important aspect – the maximum secondary circuit current. That’s because even clamp-on ammeters do not usually read into thousands of amps! So what could be measured? Firstly, using a normal multimeter across the electrodes, the AC output voltage at each of the five ‘power’ positions could be measured. (This knob selects different taps on the transformer). 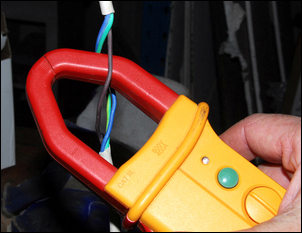 Also able to be measured, via a clamp-on meter on a modified power supply cable, was the current drawn at each setting. I didn’t measure this as a short-circuit on the secondary, but when welding 2mm + 2mm steel sheet. That gives, in terms of ballpark figures and with a 120-times voltage ratio, a calculated secondary welding current on steel of about 3,400 amps. Note that the transformer takes a short-term current gulp when welding starts - I measured this at a maximum of 38 amps. Of course, the calculated numbers are only approximate, but they give at least a ballpark comparison with other welders for which specs are available. 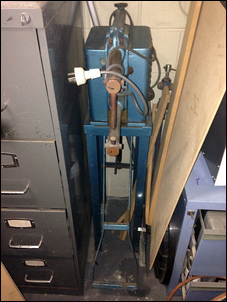 The welder is set up so that when the foot pedal is depressed, the electrodes clamp the workpiece. Press further, and a switch is triggered that activates the current. Press even further and the switch turns off the current but the electrodes remain clamped. As stated, in addition to the time of the weld able to be manually set by foot movement, the current flow can be altered (prior to welding starting) through any of five different settings. 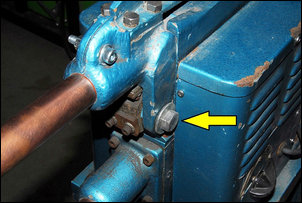 This adjustment is achieved by a knob on the side of the welder that selects different transformer taps. Note that as stated earlier, it’s easy to assume that a weld is a good one – but when it’s destructively tested, it turns out not to be! When optimising welding settings, always destructively test samples to ensure that the welds are in fact good. So the AUD$700 welder is able to successfully weld up to 2.5mm + 2.5mm steel – a very good performance. However, unlike some currently available welders, it does not have a timer – the duration of weld is set only by the operator’s foot movement. Especially when the weld duration needs to be short (eg when welding thin material), that lack of a timer is likely to result in welds that are inconsistent. So can a timer be added? 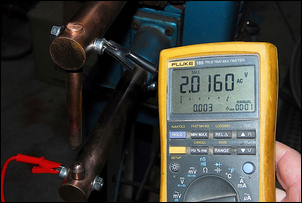 In the past that would have been expensive – what with the need to accurately switch 240V currents as high as 38 amps, and to have the weld time able to be set quickly and accurately from as little as (say) 0.4 seconds through to 5 seconds or more. But with the joys of cheap electrical modules and components available through eBay, it’s now quite achievable – and at low cost.